Don't miss this great webinar this Wednesday January 22, 2014. Our modern world is full of programmable and interactive devices. This “RAD in Action” webinar looks at how to take full advantage of them from RAD Studio. 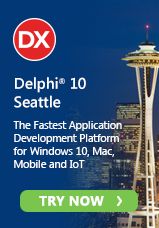 Join Embarcadero’s Jim McKeeth & David Intersimone and special guests to learn how to use Delphi and C++Builder to work with these devices and gadgets in innovative ways and extend your apps in ways you never may have imagined. Don’t miss out on this valuable technical information and inspiration for your app development projects in 2014. If you can’t make it to the live webinars, register anyway and you will receive a link to watch the replay and with companion source code samples and resources after the webinar. Please, indicate a time UTC time next.